Nacer Bouhanni (Cofidis) has taken the victory at the sixth stage of the Vuelta a España. The rider was the fastest at the bunch sprint in San Javier. The sixth stage of the Spanish grand tour was 150.7 kilometres long between Huercal-Overa and San Javier-Mar Menor, with a profile that was set to make it suitable for the fast men. The escape of the day was formed by Luis Angel Mate (Cofidis), Jorge Cubero (Burgos-BH) and Richie Porte (BMC). The trio got an advantage of more than three minutes over the peloton while behind teams like Groupama-FDJ, Quick-Step Floors and Bora-hansgrohe were trying to control the pace of the pack to force a sprint finish. With 30 kilometres to go, Cubero attacked at the front and created a gap with the other two, who were soon swallowed by the peloton. At around 30 kilometres to go, Fabio Felline (Trek-Segafredo) suffered a crash and Victor Campenaerts (Lotto Soudal), Mike Teunissen (Sunweb) and Thomas Leezer (LottoNL-Jumbo) also hit the deck. This crash, along with some winds that created echelons, broke the peloton apart and left riders like Wilco Kelderman (Sunweb) and Thibaut Pinot (Groupama-FDJ) struggling in groups behind the main one to avoid any time loses. The main sprinters were in the front group and fought the final victory. Nacer Bouhanni (Cofidis) crossed the finish line just ahead of LottoNL-Jumbo' Danny van Poppel and Quick-Step Floors' Elia Viviani. Simone Consonnui (UAE Team Emirates) and Matteo Trentin (Mitchelton-Scott) closed the top five of the day. Rudy Molard (Groupama-FDJ) keeps the leaders' jersey for another day. 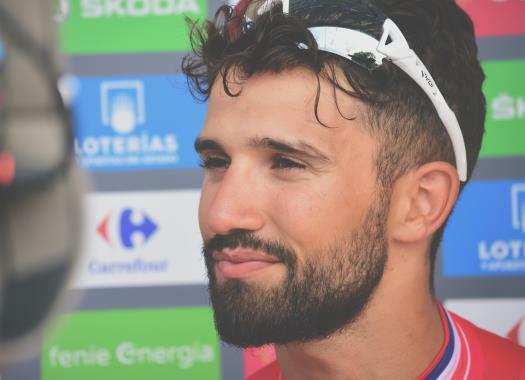 "I really wanted to win today after all those rumours that were told about me yesterday," said Bouhanni at the finish line. "Kenneth (Vanbilsen) and Loïc (Chetout) kept me in a perfect position throughout the entire day. I know how to finish when I have good legs, by switching from one train to the next until I find a good wheel, and then I launched my sprint with 200 metres to go. "I've had a difficult season and I have been really affected by the pressure. I've felt humiliated, but I had to make up for it. I was disappointed about being left out of the Tour de France because I was in a really good shape. I will not hide that I have been in contact with other teams, but Thierry Vittu (Cofidis' president) called me before the Vuelta to tell me that I have all his support. I'm very happy about giving this victory to Cofidis."